NickLannon.com: The Wildcats are Rich! Yesterday, my alma mater, the University of Arizona, hired Rich Rodriguez (formerly of West Virginia and formerly and ingloriously of Michigan) as head football coach. The Wildcats fired Mike Stoops (who they hired hoping for some of that Stoops-brothers magic to float over from Oklahoma) during the year. This is, to my mind, an unassailably good hire. Arizona is a basketball school, and always will be. Even the year we had our "desert swarm" defense, starring the likes of Tedy Bruschi, and won the PAC-10, the Wildcats were a non-story nationwide. Now that the PAC-10 is the PAC 12 and schools like Oregon and Stanford have risen to national prominence (and USC has maintained its national prominence), Arizona seems to get crowded out of the national narrative even more. Let me make one thing clear: I don't watch college football. I went to games when I was a student, and even painted my body red for one ASU rivalry game, but a passion for college football does not flow through my veins. I don't even follow college basketball very closely: other than highlights on SportsCenter during the season, I only watch the NCAA Tournament. Those are the only full games I watch all year. I watch no college football games except perhaps the BCS National Championship Game. Here's why: Two years ago, I tuned in for an Arizona-Oregon game in which both teams were ranked in the top 20. My wife grew up in Oregon but went to Arizona, so we were interested. The game was close -- double overtime -- but the quality of play was frightful: dropped passes, fluttering passes, fumbles, no defense. Neither of the two quarterbacks (Jeremiah Masoli for Oregon and Nick Foles for Arizona), though starters on top 20 college teams, had any prayer of playing in the NFL. Ultimately, it's the same reason I basically can't watch NCAA basketball anymore, either. The quality is just so deficient when compared to the pro game. I used to argue harder than anyone that "no one plays any defense in the NBA" and that "the players just care so much more in college." But a sea change happened in the NBA several years ago. 12 teams in the Western Conference were in range of playoff qualification coming down the stretch, and had to play hard for most of the season to make it. That season triggered a switch, and the NBA has been great every since...throwing the talent gulf into even sharper relief. There are just too many teams in the NCAA. The talent is spread too thinly. I'm a pro sports fan now, and I'm not sure I can ever go back. But for my school to get a coach of national prominence is exciting. 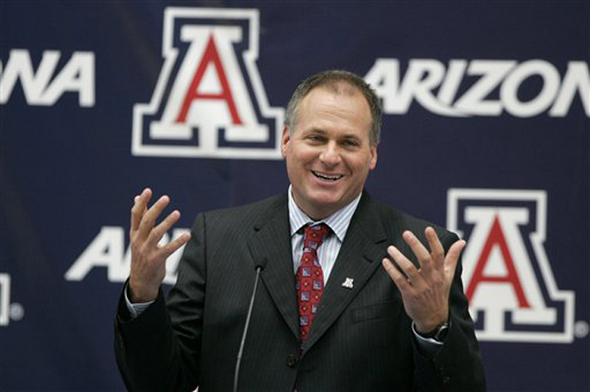 I hope Rich Rodriguez can turn Arizona football around. I think it's a great hire. Arizona football has been part of the national conversation this week, and under his leadership, might be more often. He'll have to do a lot more than turn them around, though, to get me to watch.